During those events, we have shot tens of thousands of photos, most of which are still in our digital archives. There are action shots that illustrate the agronomic or post-harvest practices we have found to contribute to improvements in cup quality: harvesting only bright red cherry, immaculate sorting, shaded raised-bed drying, etc. There are stirring coffee landscapes. Striking portraits of farmers, alone or in unlikely groups of people drawn together by ECW from countries that lie half a planet apart. And of course, plenty of the kinds of silly photos we take when we are with good friends and lower our guard. Of all the amazing ECW images in our files, this may be my favorite one of all. 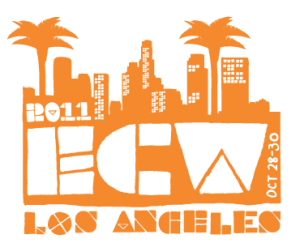 I love it because it embodies the essence of ECW and of our trading model more broadly, while also hinting at one of the dominant themes of the 2011 ECW in Los Angeles. We recently concluded our Northern Hemisphere buying season. More than 70 percent of all the Northern Hemisphere coffee we purchased was sourced through relationships that are five years old or older. More than 60 percent from relationships that are 10 years old or older. And a handful of our longest-standing Direct Trade relationships turned 15 over the past year. That’s a long time. Think about the people in your life you have seen at least once (and usually two or three times) a year for a period of 15 years. People with whom you have shared intimate moments, set goals, taken risks, celebrated successes and coped with failures. We have seen each other’s businesses and families grow. We consider the growers in our Direct Trade network more than merely commercial partners, and ECW more than just a business meeting. They are family, and ECW is an annual family reunion. This photo of everyone in our Direct Trade family breaking bread together during ECW in Los Angeles may be more illustrative of the spirit of our Direct Trade model and ECW than all the coffee photos we have. From its origins, Intelligentsia has advanced the idea that coffee is a culinary product, just as complex as wine and just as worthy of wine’s position in the culinary landscape. Over the past 20 years, as we have worked to position coffee that way, we have learned more and more about where great coffee comes from, and we have invested all along the supply chain in the people who make it great, from the farms where our Direct Trade coffees are grown to the coffeebars where they are brewed to order. Our goal isn’t just to unlock all the latent potential for sweetness and flavor in our coffees, but to elevate them by giving them the presentation they deserve and changing the way consumers think about coffee. At ECW 3 in Los Angeles, we partnered with chefs — the rock stars in our food systems — to make that point for us through a six-course tasting menu that featured a fresh-crop single-origin coffee from our menu with each dish. This shot for me is a nod to our aspiration to elevate the way our coffee is sourced, served and perceived in a marketplace that values terroir, traceability and flavor. Coverage of the sensory exercises that have been a staple of ECW since its inception. We wanted to use the first ECW ever held in the United States to give our Direct Trade partners a better sense of what we do at our end of the supply chain, so we handed them the keys to our roasters as the Sprudge scribes looked on.